From the days when Daewoo went all-American on us, does the Lacetti make any sense as a used buy? Remember Daewoo? The Korean firm that arrived on these shores in the mid-nineties blazing a trail of cheap cars with no haggling sales setups? They did OK for a while too, until a takeover by General Motors led to a complete re-brand. 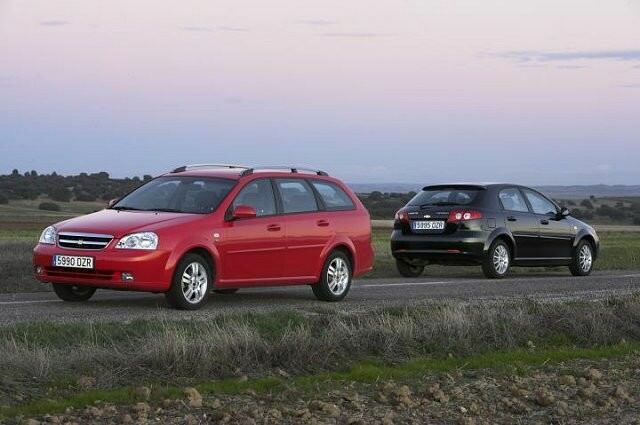 In 2005, all the existing Daewoo range, the Lacetti included, were rebadged almost overnight to become Chevrolets. Were we fooled by the all-American branding? Not really. Not at all in fact, but of the re-badged cars, the Lacetti was probably the best. The Lacetti was available in three body styles, all similar to a Ford Focus in size. You could have a five-door hatchback, a four-door saloon or a five-door estate. The hatchback’s styling was always a little different to that of the four-door and estate’s, so you won’t necessarily immediately spot it as being a Lacetti. Astonishingly, given its rather bland looks, the hatch was actually designed by legendary Italian styling house Italdesign. Inside, you get reasonably good space in both the four-door and the hatchback, but don’t expect too much from the cabin in design or quality terms. The Lacetti is reasonably well put together but the grades of plastic used are closer to the 1980s than the 2000s and the whole cabin usually whiffs faintly of the resins used in those plastics. It’s decently comfy but not much more than that. The driving experience is anonymous at best, and the Lacetti will also lack a lot of the sorts of safety kit that we now consider vital. Don’t even bother looking for electronic stability control – you won’t find it. The engines, all petrol, are 1.4-, 1.6- or 1.8-litre, but you’ll probably only find 1.4s and 1.6s in Ireland. By 2005 standards they were pretty well equipped with power steering, remote central locking and a CD player but by modern standards they’re pretty bare and bereft. On the reliability front, the engines tend to go forever, but check things like the exhaust (which gathers rust easily), the switches and switchgear, the seats (for collapsing cushions) and the alloy wheels (for damage). The best Lacetti was always the estate. It managed to look a little more imposing and classy than either the saloon or the hatchback, and with the 400-litre boot you could at least convince yourself that it was a cheap way to extra space. As little as €3,950 gets you a 2009 version so they’re certainly not expensive. It was never an exciting or desirable car when new, and time hasn’t been kind to the Chevrolet Lacetti. Track down an estate for small money though and it’s a reasonable route to cheap, spacious motoring.